SPOKANE — Tristian Frye remembers feeling terrified about her chances of finding a job after spending 12 years in prison for second-degree murder. "I was scared. I couldn’t do anything,” the 34-year-old said. “I didn’t know what I was coming out to." That all changed after she went through technical and vocational training offered by the Department of Corrections’ Correctional Industries (CI) division. Frye credits the skills she learned in the program for finding a new career – carpentry. She now works as a carpenter’s apprentice for a Carpenter’s Union in Spokane. CI gives inmates like Frye, who are nearing the end of their sentences, the opportunity to learn career training and other skills to get and keep a job. Frye was sent from prison to a work release facility where she participated in CI’s Trades Related Apprenticeship Coaching (TRAC) program. That’s where she learned how to use tools, perform minor electrical repairs, and build and maintain sections of the interior and exterior parts of buildings. When she first started work release, Frye said, she had no transportation and had to carry 80 to 90 pounds of tools a mile to and from her work site at the Spokane Convention Center each day. "It was hard work, but it’s really boosted my confidence,” Frye said. “Carpentry has always been thought of as a man’s field, but I discovered that I could do the same amount of work as a man. I discovered I was smart, I was capable. I kept challenging myself, and kept going. I learned I could do something with my life." 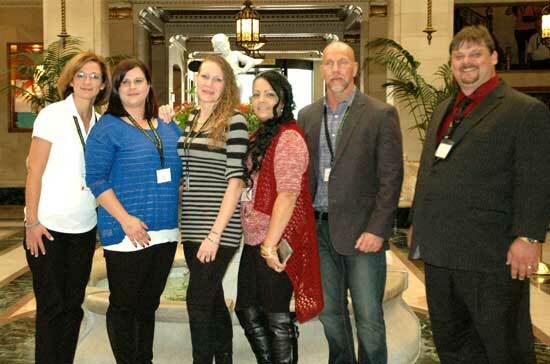 Frye, along with a panel of four other former inmates who gained employment after completing training through CI, shared their stories at the 2015 Western National Correctional Industries Association conference held in Spokane. The four-day conference also hosted workshops on topics such as “the IF project,” which has reentry mentoring and training projects for incarcerated women and men and gender responsive practices in correctional settings. Casey Kallay, a custom cabinet designer for Tacoma-based Westmark Products. Kallay spent his 13-year prison sentence working for CI as, a machine operator and drafter, while earning technical design certifications through Pierce College. Christina Mannering Shanks, who worked for CI for ten years and is now a drafter for an Auburn-based concrete company. Jason Pershing, who completed CI technical design courses and is now a machinist and programmer for Kirkland architectural design company in Kirkland. Angela Vargas, who spent a decade of her incarceration working for CI and the Washington State School for the Blind’s Braille Services Program. She is now the school’s Braille Project Coordinator and is in charge of an apprenticeship program at the Washington Corrections Center for Women. For 90 minutes, the former inmates shared their stories and their insights on finding a job after prison. One of the biggest challenges inmates have to overcome when searching for a job isn’t just working past their criminal records but gaining confidence in themselves, according to Pershing. "I think a lot of people put themselves in their own prisons,” Pershing said. “They count themselves out before they even get out. You have to get used to thinking that there is life beyond those walls." Vargas added one of the most important skills she acquired through CI was computer literacy. She said inmates who have served long sentences in prison often re-enter society with technology skills that are outdated, and this can hinder their job prospects more than their criminal records. "I was able to keep up with the latest software, and that made me competitive," she said. Vargas said the most valuable advice she can offer other inmates is "not to let the rejection of others slow you down. You’re going to be rejected hundreds of times, but you just have to persevere. Someone is going to say ‘Yes.’ I’m ashamed of my crime, but I am not ashamed of who I am now."